US Major Raymond J. Getz MD served under General George S. Patton’s Third US Army in World War II. He organized the administration of hospitals for liberated POW’s released from Nazi concentration camps. Getz survived combat in France, Luxemburg, and Germany. 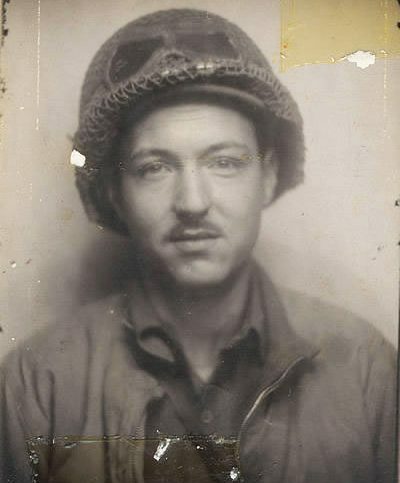 The Major earned the Bronze Star, Purple Heart and four Battle Stars and was also a photographer. I have waited over twenty years to show the public the work of Raymond Getz. In 1965, Getz died of leukemia. In 1966, my family purchased his Denver residence. Shortly thereafter, we found a chest containing invaluable artifacts collected by Dr. Getz in World War II. My father telephoned Getz’s widow, who sold us the house, to ask if she wanted the items in question. She did not. At age twelve, Getz’s war chest was given to me and I’ve treasured it ever since. Included in the trunk was a thick leather-bound scrapbook, issued to all Third US Army officers, entitled European Theater of Operations. The opening image is of Gen. Patton saluting his men. Humiliated French collaborationists, burning buildings, hand to hand combat, bombed out cities and the casualties are all encapsulated in this book. Getz taped his own personal photographs into the official album. Major Getz took hundreds of brilliant black and white photos throughout his tour of Europe. His images document the personal experience of American soldiers doing their duty under the best and worst of circumstances. Getz served as a doctor at Battalion Aid Stations at the battlefront of the Third Army. Dr. Getz memorialized the idle time he spent with fellow doctors reading, contemplating and picnicing by high alpine lakes resplendant with swans and snow-capped peaks. Then, of primary historical significance, are his personal photos of the holocaust, Nazi death camps and his patients, the survivors. Major Getz photographed the human skeletons, corpses and ovens, all under the white Alps of Austria. Surprisingly, Dr. Getz made quite a number of introspective self-portraits. In the same album, Getz included photographs taken by an unknown German officer, which ironically show how similar life was for soldiers both sides. These tourist photos depict ancient European buildings, mountains and villages before and during the war. Additionally, there are pictures of the 1936 Berlin Olympics and of the Nazi occupation of Paris. Finally, found within Getz’s war chest were two Nazi flags, presumably taken by the Major from concentration camps. The contrast between the beauty and the brutality captured by Getz is a testiment to what it was like for an American doctor to experience the horrorific crux of the 20th century’s defining moment on the battlefront and in its aftermath. Looking back, I can see that my life has been influenced by Getz’s album. As a boy, I considered his book to be my most valuable possession and kept it close at hand. I became fascinated by everything about World War II, the battles, the Nazis, the generals and of course, the holocaust and its significance. I tried to imagine the reality of the war, read every book and saw every film available to me. I spoke to WWII veterans whenever possible. Getz became like a relative to me. As a teenager, I was drawn to live under military dictatorships in Paraguay and Chile as an exchange student. I would not have gone without the Getz influence. Before leaving for South America, I had been interested in joining the military. My first hand experiences under military dictatorship transformed me into an anti-war activist during my college years. I was eventually convicted of Federal Trespassing at an anti-nuclear war demonstration at the Rocky Flats Nuclear Weapons Facility near Boulder, Colorado. In the same period, I was drawn to study medicine, perhaps the Getz influence again. However, I was plagued with a seven year headache that began in Paraguay. As a result, I became so disillusioned with Western medicine that I didn’t want to spend any more time in a doctor’s office even if it were my own. That led to an interest in the arts as a way of communicating my dilemmas. I have a Master of Fine Arts degree from The Chicago Art Institute and teach there. I readily identifed with Getz’s self-portraits and what they ineffably describe. I believe the Getz album is of historical and artistic relavance and deserves to be seen by the public. I am presently at a stage in my art career where I can present Getz’s work in a professional manner at major museums, universities and galleries both in the United States and in Europe.